What are you reading right now?” – a common question for me. I want to know what you’re reading – what is challenging, beautiful, engaging… even transformational about the words dancing across your pages. And I absolutely love to linger in thoughtful discussion of a book. I am partial to classic writers and thoughtful styles. Classics include universal elements that transcend time and space. They’re written formally enough to eliminate too much slang; and, they uniquely apply throughout time. The writer leads the reader so far, but the reader is expected to engage as well. However, I also see the niche for more culturally attuned pieces. These words meet readers bent on observing exclusively, excusing, or even escaping. These authors patiently woo readers into active participation. 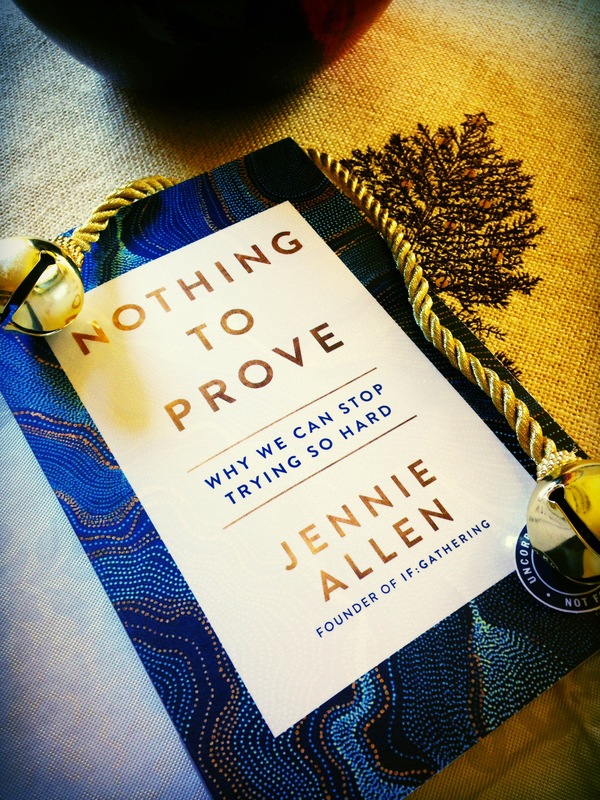 Nothing to Prove by Jennie Allen is one such book. She draws from the Gospel of John… taking the willing reader from seat of observer to stepping into a stream of personal evaluation anchored in classic truth with a current compassion for today’s personal and cultural challenges. Nothing to Prove… What a refreshing read! The writing is easy to read. If you’ve ever felt your worth is the sum of your achievements, honors, & accolades, then this is a read for you. Take your time, though… it is more of an experience than a read. The full title… Nothing to Prove: Why We Can Stop Trying So Hard was initially hard for me to swallow. If I’m honest, I mean, I think I might really like trying so hard. I mean, I remember learning very early in life how getting the highest test scores, selling the most girl scout cookies, running the fastest… even memorizing the most Bible verses felt… and how adults hand out accolades & peers sneer with envy for such achievements. All that can be pretty energizing… for a while. And if we look around & listen, we’ll see shining people with polished personas and almost unconsciously push forward & play the pretty perfect game – from appearance to earning to achievement to expertise… even attaining a honed false humility, right? This book opens with Jennie’s confession and a real recognition of the real battle. Akin to CS Lewis’ Screwtape Letters, Jennie’s “If I Were Your Enemy” poem lays out the simple lies. Yet, how often I listen to those very lies. Thankfully, Jennie doesn’t leave us stranded in the mounting tension of addressing an enemy we’d prefer to pretend away. Rather, she leads us to the Source of Living Water, helps us identify and overcome personal obstacles to living purely and presently… from a place acknowledging & receiving our daily thirst as an indicator to receive daily provision. Where is the provision found? In the eyes of humanity around us or around the world? Do we impress them with our false selves? Maybe. But, that is certainly not the point. The point is seeking position and approval can become a cyclical idol that distracts us from living abundantly as we’re created… All that energy may actually be robbing us. the One Who was, Who is, Who always will be – He Alone Is Enough. Jennie authentically points to the person of Jesus’… His authority, mercy, and grace make this read profoundly human & accessibly divine. This book is easy to read, but let me again encourage you to enter this book like a retreat. Recognize the parch-ness. Don’t panic or rush the process. Arise, and enter this stream … relax into a posture of expectancy. Personally, I especially appreciate the experiential guide at the end of each chapter in Part 2. Let me humbly urge you to take your time through this guide. And keep it close as it will be a useful tool for future refreshing. Honestly, I read this book three times over Christmas break (I’m on the book launch team, so I received an early printing.) The first run through… I looked at premise, outline, supporting details, application. Maybe, you might say it was my academic run-through. The second time through, I prayed that the Spirit would lead me to the challenges my heart & mind needed to walk deeper with Him. This reading took longer. Why? Well, I think I became reluctant to the uncomfortable elements that I needed to move through in order to even desire a state of being enough in Christ alone. I think I convinced myself nearly two decades ago that when committed to be a stay at home mom (until the children went to school or so I thought) I “freed myself” from the ladder of external expectations. I had dealt with the external disappointments of so many who had “high hopes” for my career achievements… ya know, for just a few years. Please don’t get me wrong- our excellence is an acceptance we’re His Image -bearers; thus, we ought to live accordingly. Yet, an attitude subtly bends- maybe toward perfectionism or mediocrity or anything in between-toward such a stance garnering personal glory or pity. He doesn’t want my performance; He wants to envelope my utter weakness with Himself. Whatever excellence we get to offer this world in the fleeting moments we’re here ought to be purely a response to Who He Is. The dimensions of formulating and executing education… deeply daunting. And yet… time and time again this burning passion and meager confidence is exactly what the Lord has used all this remind me daily – “I am not enough.” Yet, He Is. And the third time through? I think I am realizing how reluctant I am to peel back another layer of weakness… and another… and another. Well, this book will be a return-to, a retreat read again & again. Why? Part of the refreshing is that weaknesses reveal need. My bristling to that need reveals pride. And I think pride must be combated throughout a lifetime. The beauty & hope of it all … we don’t maneuver all this alone. Thank you, Jennie Allen… for your writing, your example, your tools (IF:Equip is my favorite! ), for humble boldness that leads teams that lead teams to Jesus… whether we meet on here or on the heavenly shore, thank you for patiently and passionately going deeper still… and not satisfied to go alone. P.S. As I enjoyed a brief writing sabbatical over the holidays, I dove into some excellent reads. So, I’m planning to share a few of my more current reads here throughout the year. Also, you can find our extended family story at Shadows Presence. Yes! It took me almost two months to read this book but I don’t think the truths and lessons would have sunk in and fostered change if I had read it quickly. I am thankful to find some other voices to follow by reading through the launch team blogs. Totally agree, Amy! Such joy knowing we’re not alone as we journey.